The U.S. Debt Spiral: When Will it End? More Importantly, HOW Will it End? So says Michael Snyder (http://theeconomiccollapseblog.com) in edited excerpts from his original article*. All debt bubbles eventually burst and, right now, we are living in the greatest debt bubble inthe history of the world. Over the past 30 years, household debt, corporate debt and government debt have all grown much faster than our GDP has – but no nation on earth has ever been able to expand debt much faster than national output indefinitely. The clock is ticking on this debt bubble and when it collapses we will say “bye bye” to our vastly inflated standard of living and we will discover that we have destroyed the economy for all future generations of Americans. Sometimes a picture is worth a thousand words. When most Americans think of the “debt problem” in this country, they think of the debt of the federal government but that is not the only debt bubble that we are facing. Thirty years ago, household debt in the United States was approaching the 2 trillion dollar mark. Today, it is sitting at about 13 trillion dollars [as shown in the graph below]. We have been trained to pay for everything with debt. We pay for our homes with debt, and mortgage debt as a percentage of GDP has more than tripled since 1955. We pay for our cars with debt, and at this point about 70 percent of all auto purchases in the United States involve an auto loan. We pay for higher education with debt, and the total amount of student loan debt in America recently surpassed the one trillion dollar mark. Wherever we go we pay with plastic. Amazingly, consumer debt in America has risen by a whopping 1700% since 1971 and, if you can believe it, 46% of all Americans carry a credit card balance from month to month. We are absolutely addicted to debt and we do not know how to stop. Our state and local governments are also addicted to debt. 30 years ago, state and local government debt was approaching the 400 million dollar mark. Today, state and local government debt is hovering around the 3 trillion dollar mark [as illustrated in the graph below]. In the United States today, we don’t just have one “government debt problem” – the truth is that we have hundreds of them. All over the country, state and local governments are facing bankruptcy because of too much debt. The city of Stockton, California, for example, is right on the verge of declaring bankruptcy. Of course the biggest offender of all is the federal government. 30 years ago, Ronald Reagan was running around proclaiming what a nightmare it was that the U.S. national debt was reaching the one trillion dollar mark. Well, [as the graph below shows,] we are about to blast through the 16 trillion dollar mark with no end in sight. Running up debt at a much faster rate than our GDP is rising is a recipe for national financial suicide. Our politicians continue to steal about 150 million dollars an hour from future generations and everybody just acts like this is perfectly normal. Now let’s add up all the debt in the country. When you total up all household debt, business debt and government debt, it comes to more than 300% of our GDP [as shown in the graph below]. In fact, if current trends continue we will hit 400% of GDP before too long. Total credit market debt owed is roughly 10 times larger than it was about 30 years ago….and if we do that again in the next 30 years, our total debt will be more than 500 trillion dollars in the 2040s. Unfortunately, that’s the way that debt spirals work. They either have to keep expanding or they collapse – so will the U.S. debt spiral continue to expand or will we soon see a collapse? Sadly, this exact same thing is happening all over the world. 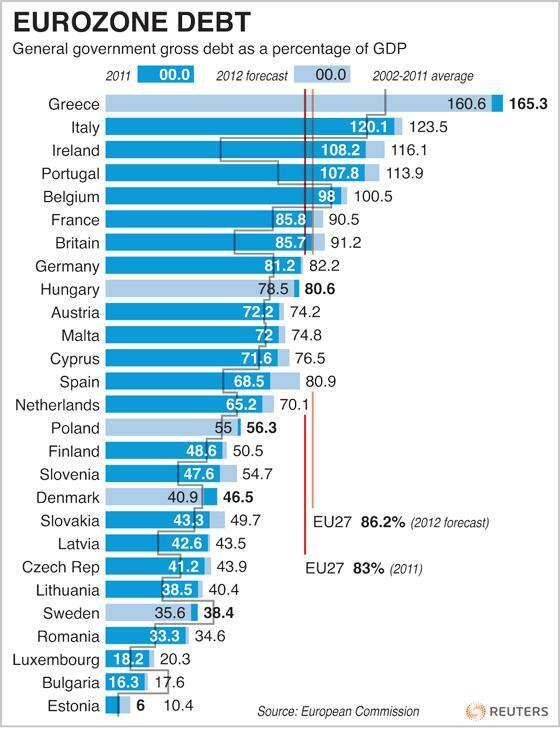 The government debt-to-GDP ratio in Japan (the third largest economy in the world) blew past the 200% mark quite a while ago, and almost every country in the EU is absolutely drowning in debt [as can be seen in the table below added by the editor of munKNEE.com]. The world has never faced anything quite like this. There is way, way too much debt in the world, but the only way we can continue to enjoy this level of prosperity under the current system is to pile up a lot more debt. The western world is like a debt addict in a deep state of denial. Some debt addicts end up with dozens of credit card accounts. They will keep opening more accounts as long as someone will let them. Most debt addicts actually believe that they will be able to get out of the hole at some point, but most never do. even greater prosperity is still ahead. Sadly, what the mainstream media and the two major political parties are telling them is a bunch of lies. We have enjoyed the greatest prosperity that we will ever see in the United States, and when the debt bubble bursts there is going to be an immense amount of pain. That is a very painful truth, but it is better to come to grips with it now than be blindsided by it later. 10. Martin Weiss: You Are Being Forewarned – Again – About an Imminent Financial Megashock! 11. The Zombification of the Financial System: Debt is NOT a Free Lunch, Debt is NOT Wealth!